Jackpot Fruity Casino is operated by the Cassava Group, and since they are also behind the 888 brand (among others) you can be pretty confident that they know what they are doing. In common with most online casinos, they advertise their welcome bonus offer front and centre so it can’t be missed. 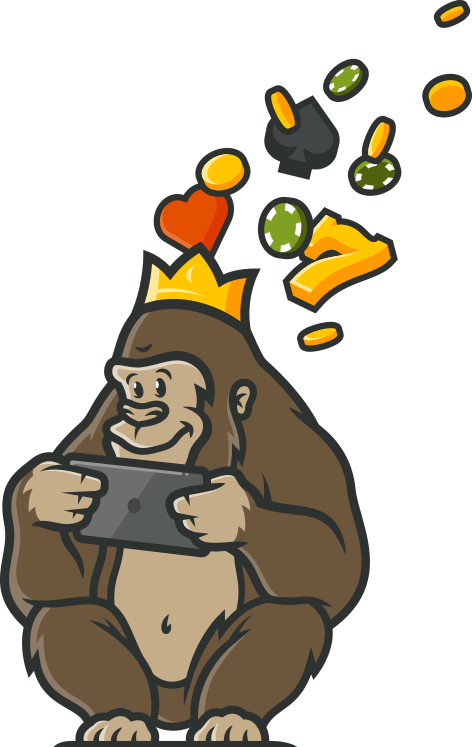 The Casino Gorilla has gone over the terms of that offer to ensure that it is a fair deal, and you’ll find out what he thinks about it below. The big hairy reviewer has also been going over the rest of this site to see whether he can recommend it to you or not. Read on to discover exactly what he thinks – and if there’s something the big guy doesn’t like, you can be sure he will let you know! The Casino Gorilla is a straight-shooter, after all you don’t get far in the jungle if you are the shy and meek type. That’s why he is not afraid to say that he plain does not like the bonus offer from Jackpot Fruity Casino. So it looks alright at first glance: a 100% matching bonus of up to £500 with 25 free spins thrown in on top, followed by two more 50% bonuses to take the grand total up to £1,500. What could be wrong with that? Well first of all, the free spin winnings are capped at a miserly £10, which is not good. More importantly, the wagering requirements to be able to withdraw the bonus plus winnings from it are a ridiculous 40 times deposit plus bonus. That means if you deposit £500 to take full advantage of the first deposit offer, you will have to bet through the enormous sum of £40,000 to release your cash! This is much higher than the average casino and does not give you much chance of cashing out that bonus. When you make your first deposit of a tenner or more with Jackpot Fruity Casino you will earn 25 free spins. However, as we mentioned before, the most you are allowed to win from these is £10, which is not a great deal. What’s more, even to withdraw any winnings you must wager that winning amount 70 times, which is way, way higher than most casinos ask you for. This is not a great offer! No bonus code entry is required in order for you to take advantage of the welcome bonus offer. That’s if you even want to take it after it has been slammed by the Casino Gorilla! Just make your deposit of £10 or more and the bonus money will hit your account. Best of luck with your attempts to clear that steep wagering requirement – some will manage it, but it is a tall order. If you are mad about live dealer casino games, then unfortunately you are going to be pretty mad about the poor selection available here. There are just four tables, so it’s roulette or blackjack or nothing. 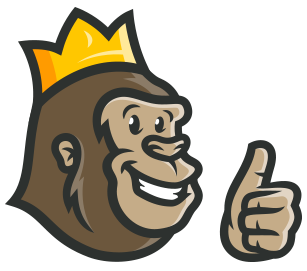 The Casino Gorilla enjoys nothing more than whiling away an hour or two in a live dealer casino room, so this is another feature of Jackpot Fruity that has displeased the big guy. The way that Jackpot Fruity Casino is laid out makes it ideal for mobile users. It is very easy to navigate around the site and to find exactly the game you are after. This site works perfectly with any modern tablet or smartphone, regardless of whether you are an Android addict or an Apple aficionado. No need to download anything, just enter the site name in your browser and start playing your favourite games. Below you can see the list of payment options available to customers of Jackpot Fruity. This is that rare casino which does not offer either Skrill or Neteller, although UK players will be able to use PayPal for deposits and withdrawals. The withdrawal methods are debit/credit cards, Entropay cards or via PayPal, provided that you used one of those methods to deposit. You may also have the option to make a wire transfer. Minimum deposit is a tenner, and you may have the option to increase your limits for deposits and withdrawals if you speak with the support team. With licenses from both Malta and the UK, one thing you can be sure of with Jackpot Fruity Casino is that it is safe and secure. The games on this site come from highly respected providers and are individually tested to make sure they are functioning fairly and correctly. All personal information will be held securely thanks to the use of the latest encrypted software, which also protects all financial transactions. It is fair to say that Jackpot Fruity have not put a whole lot of effort into the FAQ section on their site. There are a mere five questions and answers here, so if by chance your query is answered on this page it is more by luck than design. You can get in touch by email, and the casino says they will get back to you in a rather sluggish 72 hours. There is no live chat support either, so unfortunately this is another area where this casino fails to deliver. There is a pretty hefty list of countries where Jackpot Fruity Casino is unavailable, although if you have read the rest of this casino review you may not be too disappointed by this. Residents of these countries will need to go to another casino if they want to play online: Albania, Asia, Australia, Belgium, Czech Republic, Denmark, Estonia, France, Italy, Latvia, Lithuania, Macedonia, Malaysia, Russia, Slovenia, South Africa, Spain, Sweden, Turkey and the United States. If your country is not on the list but you’re not sure whether you are eligible to join or not, then the best suggestion is to get in touch with the customer support team. UK-based players are most definitely welcome though. Despite appearances to the contrary, the Casino Gorilla is actually a fairly positive character. With that in mind, the positives about Jackpot Fruity Casino include that it is mobile-friendly, it boasts some good slot games, and it is fully licensed and secure. However, the negatives cannot be ignored. There aren’t as many games as you will find on competitors’ sites, there is no live casino, and the wagering requirements on that welcome bonus are much too high. If you are really stuck for options then feel free to give Jackpot Fruity a go, but there are a lot of better online casinos out there.